Thursday July 18 1907 I was busy with the housework part of the forenoon I sewed some today I changed the new dress skirt I bought lately. I did other sewing. I caught 12 chickens in evening. 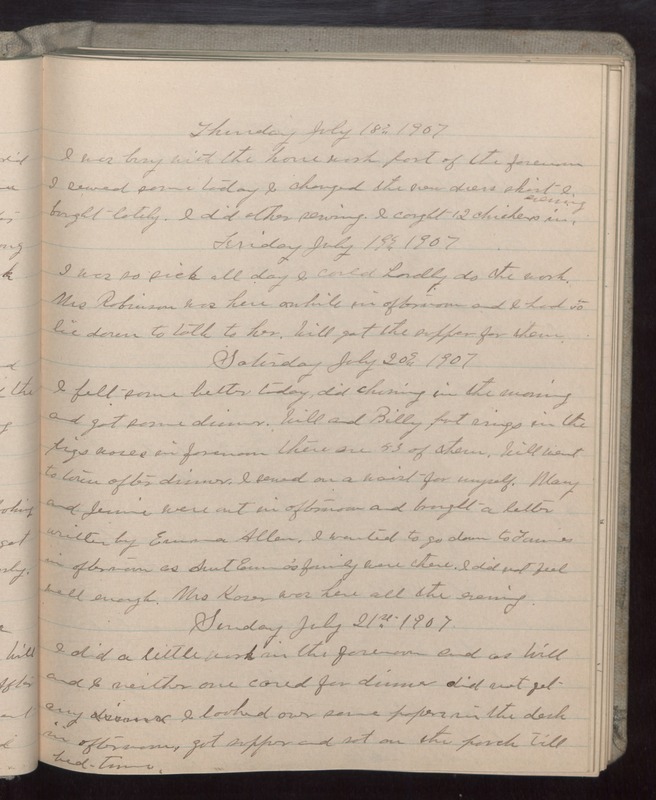 Friday July 19 1907 I was so sick all day I could hardly do the work. Mrs Robinson was here awhile in afternoon and I had to lie down to talk to her. Will got the supper for them. Saturday July 20 1907 I felt some better today, did churning in the morning and got some dinner. Will and Billy put rings in the pigs noses in forenoon there are 53 of them. Will went to town after dinner. I sewed on a waist for myself. Mary and Jennie were out in afternoon and brought a letter written by Emma Allen. I wanted to go down to Fannies in afternoon as Aunt Emma's family were there. I did not feel well enough. Mrs [Kover?] was here all the evening. Sunday July 21 1907 I did a little work in the forenoon and as Will and I neither one cared for dinner did not get any. I looked over some papers in the desk in afternoon, got supper and set on the porch till bed-time.